Looking for kids' birthday party ideas? 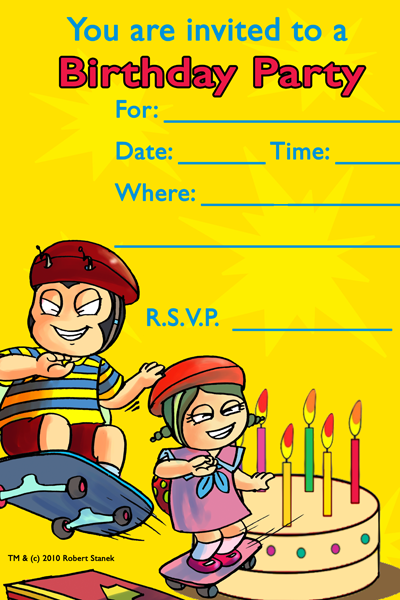 Get your party started by printing these free Bugville Critters invitations. 2. Cut out the invitations. Guest List - More Birthday Party fun! A colorful guest list to go along with your Bugville Critters party. List your guests and track their RSVPs. Color Name Plates - Colorful name plates for each party guest to go along with your Bugville Critters party. Label the name plates with guests' names or leave them blank so guests can fill in their own names when they arrive. Birthday Certificate - A birthday certificate for the birthday child complete with a birthday banner and a birthday cake. Award Certificate - An award certificate for party guests or to give out any time to a special child. Cool Fact #1: Robert came up with the idea for the Bugville Critters in the 1990s and wrote the first book in 1996. When that book was published in 2007, over a decade later, Robert had already completed over two dozen Bugville Critters books. As of 2010, all of the original books are now fully illustrated and being released in print. Cool Fact #2: Robert's children are the ones who urged him to get the Bugville Critters books published and that is what he set out to do in 2004. Once he decided on getting a publisher, it took nearly four years to get the first set of books into print. Cool Fact #3: To bring the books to audio, Robert began working with voice artists in 2005. It took two years of work with multiple voice artists to get to the release of the first Bugville Critters audio book and five years to complete the production of all the original books. All of the original books were first released in audio and then in print.